US ▼ 2012-11-18 $39.99 ? JP ▼ 2014-05-15 ¥6,980 ? (Bonus Edition) 2012-11-18 $? ? (Bonus Edition) 201x ? ? (Bonus Edition) 201x NT$? ? (Limited Edition) 2012-11-23 ?RUB ? US ▼ 2013-08-13 $29.99 ? UK ▼ 2013-08-13 £24.99 ? EU ▼ 2013-08-13 €29.99 ? DE ▼ 2013-08-13 €29.99 ? AU ▼ 2013-08-13 $49.95 ? KR ▼ 2015-01-29 ₩39,800 ? US ▼ 2014 $? ? 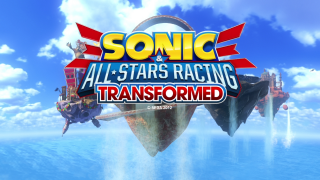 Sonic & All-Stars Racing Transformed was announced on 30 April 2012. It is the sequel to Sonic & Sega All-Stars Racing and was directed by Gareth Wilson, the former lead designer of Blur, a similar racing game that also uses power-ups as a prominent feature. It was released on the consoles Xbox 360, PlayStation 3, Wii U, and PS Vita in late 2012, Steam and 3DS in early 2013, and iOS and Android in early 2014. The game was released in Japan on PlayStation 3 and Wii U on 15 May 2014. The game's sur-name comes from its new transforming vehicle system, which allows players to traverse land, sea, and sky by transforming their vehicles mid-race via transform gates into cars, boats, and planes, allowing for much more varied tracks. Each vehicle type handles differently to simulate the differences between the environments (for example roads for cars versus water for boats). The courses also change with different features during each lap, usually changing the routes traveled on during the race, so the courses are always evolving during the race. The game has characters from several of Sega's previous franchises making their debut in the All-Stars Racing series, including Gilius Thunderhead and Vyse who both were cut from the previous title's roster. They were chosen along with new Sega franchise characters and characters from Non-Sega franchises with additional characters planned for DLC. The two Non-Sega characters included are Ralph from the Walt Disney movie Wreck-it Ralph who is in every version, and real professional NASCAR racer Danica Patrick, who is in every version except the mobile versions. Revealed through hacking, there also exists additional characters such as characters from the Football Manager series, Shogun: Total War series, as well as an appearance from another non-Sega property, Team Fortress 2. These characters were officially revealed as exclusive characters for the PC version via a trailer released on January 17th 2013. While they are for the PC version, they appear on the disc for the console versions as well. Ryo Hazuki was announced for the newly revealed mobile versions of the game. Race for the top position while utilizing power ups. Race for the top position while utilizing power ups. All players start with three hits. Once all off their hit points are gone, they are out. The last surviving player wins. Fly through the rings in order before time runs out. Any missed rings will deplete your remaining time. Dodge cars while weaving through the course. Green Cars will stay in one position. Yellow Cars will weave left and right. Blue Cars will try to stay in front of you. Race against a rival racer through several rounds. Whoever is in front before time runs out or if they pull far enough ahead, they are delcared the winner. Collect ammo and fire at a fleeing enemy tank in a race course. The following game modes can be played offline or online and may be chosen when playing online via matchmaking by specifying race, battle or lucky dip which randomly chooses game modes. Fight to survive using power ups. All players start with three hits. Once all off their hit points are gone, they are out. The last surviving player wins. A Chao balloon and a capture point spawn in random spots. Bringing the Chao balloon to the capture point adds to the players score. Reaching the target limit or capturing the most before time runs out declares the winner. Race for the top position. There are no items to make use of, only boost pads will help racers in this mode. The following modes are exclusive to the Wii U version and can only be played locally. The player on the Wii U Game Pad will play as a specific character using specialized controls and features. Players on the Game Pad play as Aiai as he rolls a monkey ball around to crush the other racers. Players on the Game Pad play as Joe Musashi as he must run into other racers to tag them. The race courses in this game are all based off of different Sega franchises, and unlike the first game they are not limited by theme or franchise. A Bonus Edition of the game was planned, and contained DLC content for the game. The package came with a code to unlock a new course and character like the previous game, an OutRun-themed course and Metal Sonic as a playable racer. The Wii U version did not come with a voucher as the DLC content was already on the disc. The Downloadable Tracks option were renamed to Bonus Tracks. This page was last edited on 20 April 2019, at 12:07.